Many thanks to Roger from the King’s Court Masonic Lodge who presented Bones and Hipp! !Bones with a cheque to pay for the cost of installing a shared cooker. Frustratingly, over the past year we have only been able to cook on a shared hob, or using other appliances such as a toaster or smoothie maker, but with creative planning we have managed to sustain member’s enthusiasm for cooking. Now we can extend on this to cook simple meals and snacks, developing members life skills as they transition into adulthood. Gillingham, Mere and Shaftesbury Lions Club. Many thanks for your kind donation of £200 to purchase software for our new touch screen computer. Many thanks to everyone who came along to this months cash bingo at the Olive Bowl and purchased raffle tickets. We raised an amazing £292.00 for Hipp! !Bones, special thanks go to Serena for nominating us. Many thanks to the Lloyd-Jones Family who transformed their Shaftesbury home with thousands of bulbs, illuminated Santas, penguins and reindeers, and opened up their back garden for visitors to view in return for a small donation, raising an amazing £133.45 for Hipp! !Bones Club for Youngsters with Special Needs. Please see attached link for the paper review and pictures. Many thanks to everyone who attended Stour Provest Carol Concert and donated £157.50 to Hipp! !Bones C4YSN Ltd. Many thanks for your continued support over recent years, which is invaluable in securing the future of the club and improving the provision we can provide. We would like to thank ‘Friends of Hipp! 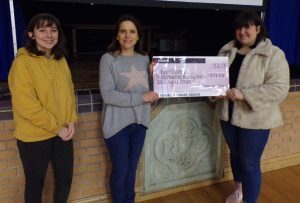 !Bones’ for raising an amazing £207.00 at the jumble sale and a further £210.00 through ‘Bags for Schools.’ Thanks to everyone who organised the jumble, made donations, and supported the event. 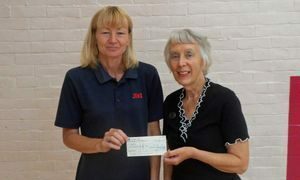 We would like to thank Eileen Piper and her team for raising an amazing £97.99 through the sale of cakes and light lunches on Saturday the 13th October; and Sandy Howard for her kind donation of £50. We raised a further £50 through our tombola. Thanks to everyone who supported this event. Each year ASDA invest over £1.4 million in over 4,000 good causes through their Green Token Giving Programme. Hipp! !Bones C4YSN Ltd is one of the three successful nominees currently put forward for voting in ASDA in Gillingham. If you shop at ASDA, please vote for Hipp! !Bones C4YSN Ltd, voting closes at the end of September. In September 2017 Hipp! !Bones C4YSN Ltd felt very privileged to be chosen as Local Charity Partners by the TSB Branch in Gillingham. 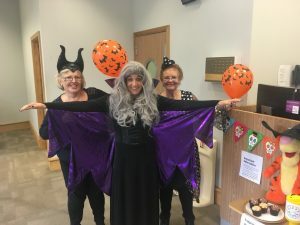 Thus far Liz Carter (Bank Manager) and her team have raised an amazing £733.79 through a variety of activities including an: Halloween Event, Guess the Name of the Teddy, and a Christmas Hamper Raffle; in addition to volunteering at our jumble sale in November 2017. We’re delighted that the TSB are extending the length of their charity partnerships from one year to two years. We were very privileged to be chosen as one of the nominees put forward for Waitrose Community Matters in March 2018, and were the beneficiaries of an amazing £580.00 Thank you to everyone who voted for us. 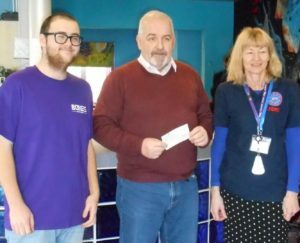 The Gillingham School Sixth Form Christmas Fair in December 2017 raised a fantastic £337.08 for Hipp!!Bones. Members of the Sixth Form presented a cheque to Hipp! !Bones C4YSN Ltd Treasurer Tracy Donegan on 8th February 2018. Tracy Donegan, on behalf of Hipp! !Bones C4YSN Ltd.
On Saturday, 15th July 2017, The Inner Wheel Club of Gillingham (Dorset) Benevolant Fund kindly presented a cheque for £200.00 to Hipp! !Bones Club for Youngsters with Special Needs Ltd.
At our Great Get Together BBQ event on Saturday, 17th June 2017, Hipp! !Bones C4YSN Ltd Chairman Cllr David Walsh was presented with a cheque for £250 by Gillingham Mere and Shaftesbury Lions Club President David Rose and his son Robert Rose.Left to right: Lions club President David Rose, Lions Club Member Robert Rose,Hipp! 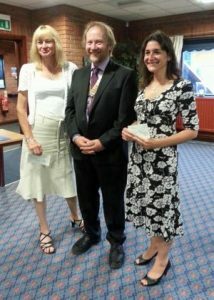 !Bones C4YSN Ltd Chairman David Walsh, Gillingham Mayor Belinda Ridout, a Hipp! !Bones member , and Youth Support Worker in Charge of Hipp! !Bones Jeni Green. 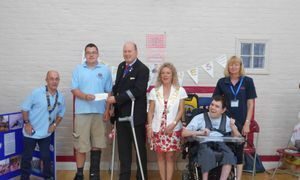 Thank you very much Gillingham Rotarians, I hope you all realise what a difference this will make to those young people.